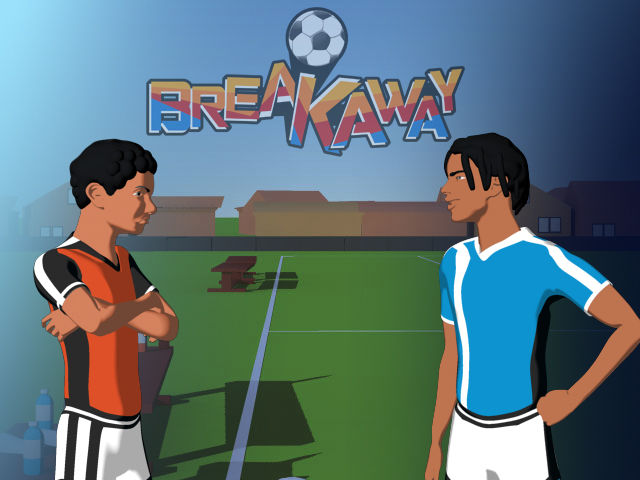 Breakaway is a story-based, football-themed electronics game that uses soccer to encourage good decisions in young people. Created through Champlain College, the development team has just released the first three episodes of Chapter One online and on CD. Better yet, they have also put it in the hands of multiple kids’ groups this year at the World Cup. Its creators hope that the game will combat violence, particularly against women, by fostering in young players a sense of power to do good in the world and not give in to peer pressure. Football season is here and you decide to try out for the best team in town. Soon, you learn that things are not as they seem, and your choices and actions will affect the lives of everyone around you. Will you follow the popular path, or will you break away? I played the first three chapters of the game yesterday online, and had a pretty good time learning how to shoot and pass. But good luck with the defensive part of the game – it is tough! The story was a little simplistic at first, but by the end of the second episode I was much more interested. I’ll give you a hint: if you choose to play, and your Breakaway teammates offer you the chance to do something bad, don’t do it. The shame these developers put you through afterward is just not worth it! Football great Samuel Eto’o is also part of the game, and his forthcoming appearance in later episodes will help raise the stakes. The game still has a long way to go – it includes 14 chapters in total, and right now they have only released the first half of Chapter One. Hopefully Breakaway can make some difference in people’s lives. The creators want to help kids acknowledge that there is a problem and that they have the ability to do something about it. After that, they want to encourage kids – especially boys – to advocate on behalf of women who are vulnerable to abuse and violence. You always have to wonder if the concept is too idealistic. But then you also have to wonder how many crazy dictators and gang leaders could have used a game like this when they were little. I guess we’ll never know completely, but hopefully Champlain College will help make people aware of the game’s successes as they find out about them. You can play Breakaway for free. All you need is a computer keyboard, the internet and Adobe Flash. The game will save your progress, and as I said, there are many more episodes to come. Cool! I love that you find this stuff and put it on my radar. Thanks!